I have maintained an interest in management effectiveness, improvement and learning over the past twenty years as a manager, consultant, researcher and educator. I have developed and delivered teaching for corporate, university and NGO programmes. My published research papers span leadership, business improvement and management development. I have recently examined how management assessment frameworks can be used to improve the effectiveness of conservation programmes and how leadership behaviour has an impact on conservation programme success or failure. Current work includes examining how innovative data analysis tools and new methods of programme assessment can improve conservation management. My research informs management development work which I am conducting in conservation programmes in Europe, North America, the Middle East and Indian Ocean Islands. Current work includes conservation genetics of big cats, primarily leopards and lions, although recent work has focused on genetic diversity at MHC genes in birds, with a focus on the endangered bird populations in Mauritius. I am also examining how MHC diversity in endangered island species, which have experienced population bottlenecks in their recent history, compares with more robust species. With big cats my work includes conservation genetics of the Arabian Leopard (Panthera pardus nimr) whilst I continue to explore the genetics of Moroccan Royal lions, the captive population thought to be descended from the now extinct North African lion (Panthera leo leo). 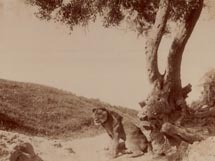 The work has reviewed the status of these lions and has led to my development of the European studbook which is now used by zoos involved in maintaining the bloodline. My recommendations have seen new zoos becoming involved holding these lions and new transfers of individual animals and establishment of new breeding pairs across the European zoo population. Research continues with these and other big cat populations in captivity and in the wild. Current work with colleagues is examining the how human-wildlife conflict data can be used to assist in focusing and managing conservation effort to greatest effect. I also maintain an interest in both the interaction of ecosystems and species with human land use and the restoration of ecosystems for both human and wildlife benefit, with a personal interest in the Mediterranean biome (particularly North Africa) and the Arabian Peninsula.